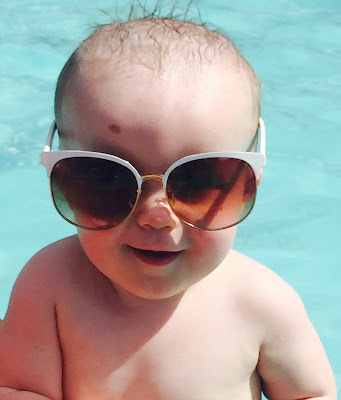 We took Campbell to the pool yesterday and he had so. much. fun. I knew this little boy was bound to be a water baby. We just had to convince him! 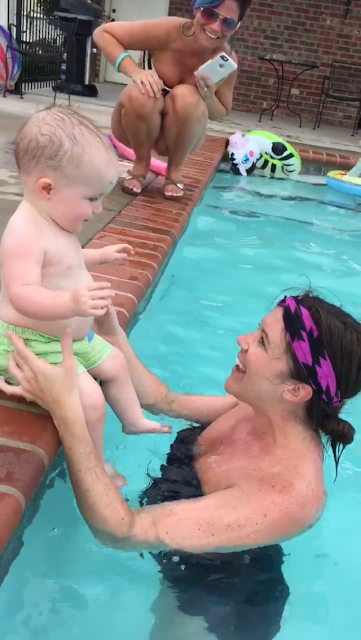 The water is finally warm and Campbell sat on the pool steps while he splashed and played with his toys for about two hours. It was so fun to see him having so much fun! We are lucky because we basically live next door to our neighborhood pool. It's pretty much in our backyard which is one of the reasons I'm able to visit it so often! Yesterday I had Scott grab Campbell's water table and bring it over so he could play with that too. It was a total win. Not only did Campbell enjoy it but all of the other kids came over to play with it too. I'm thinking about being an awesome neighbor and buying a water table to keep at the pool since it was such a hit for the littles.